As you can see from the picture above, we awoke to another grey morning. They had a complimentary breakfast at the hotel, so we took full advantage of it. We also took some oatmeal and hot chocolate as our supplies were running low. It was all you could eat! We were out the door before 8am and felt well rested. We were told by the guys at the bike shop that there was a huge hill just on the other side of the river and were expecting the worst. After crossing the river it was a bit confusing with a roundabout, but we took the right road and soon found the hill they were talking about. Considering what we had done over the past few days, this hill was a breeze. Granted it was a bit steep, but we were at the top within a few minutes. 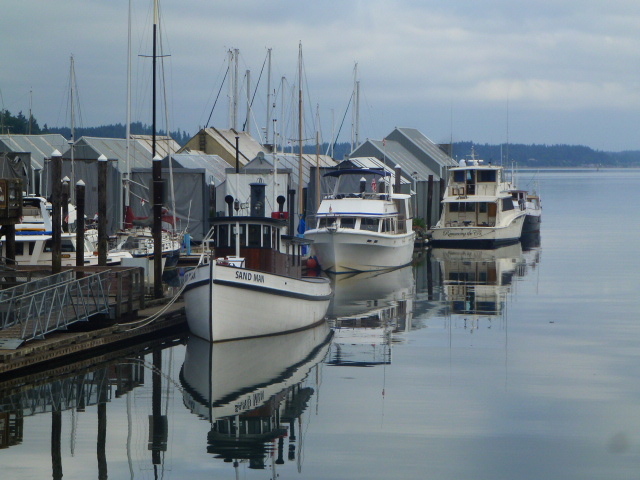 After that it was urban sprawl for a while before we hit highway 101 again ~ it almost felt like home. It was a 4 lane highway for a bit before it split and then it was down to 2 lanes again. We rode by a drive in theatre, the first Tai had ever seen. I remember as a kid going to drive in movies all the time with my parents, but they seem to be a thing of the past now. Just before noon we came upon the exit for Shelton and heard that there was a Safeway in town, so we took the exit and rode the mile and a half into town for lunch. We both had a Philly Cheese Steak sandwich for lunch and it hit the spot. It had been years since I had one, and Tai really enjoyed his. It was funny because the guys at the bike shop said we should aim for Shelton as there was a campground close by, and here we were just before noon. I think they underestimated Tai’s riding abilities. So with lunch down the hatch, we climbed back up to highway 101 and started heading north. 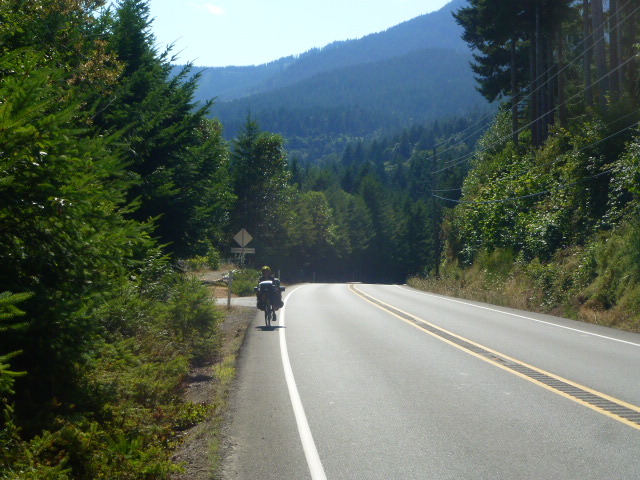 We had to ride through an Indian Reservation before we came upon the Hood Canal, and we saw a lot of fireworks stands. I thought that it would be kinda fun to pick some up, but none of them were open, and some looked like they haven’t been open for quite some time. Near the end of the reservation there was a huge casino with plenty of cars in the parking lot. This was on a Monday afternoon! Where did the shoulder go? 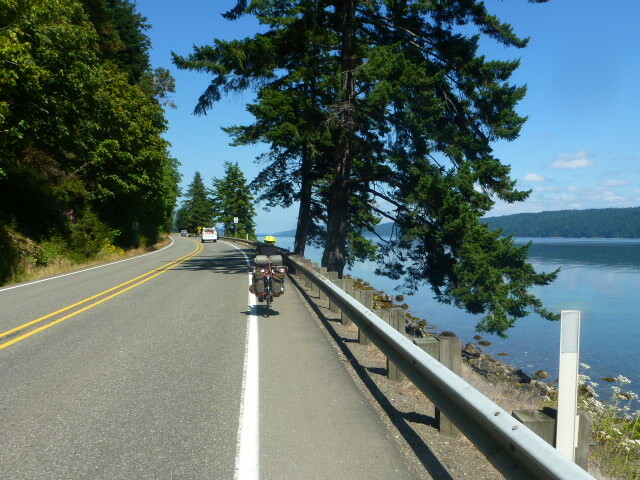 We had heard a lot about riding along the Hood Canal and it’s narrow shoulder, but for the most part it was pretty good. 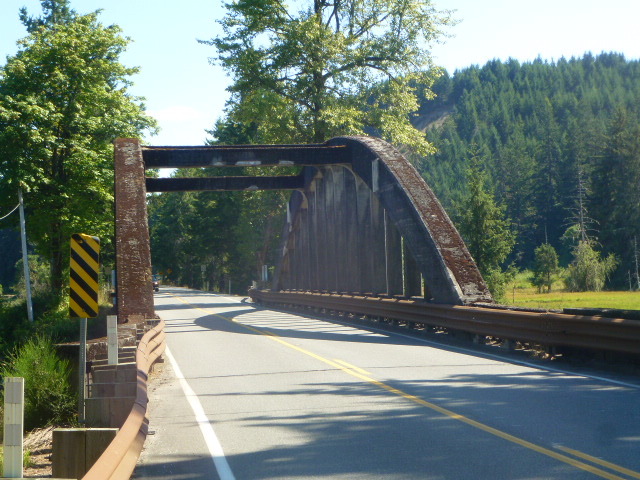 There were some narrow spots and of course when you got to a bridge the shoulder disappeared altogether, but that is to be expected in Washington state. By this time the weather had also cleared and it turned into a beautiful day. We spent a pleasant afternoon riding up the Hood Canal and even got to see a car fire on the side of the road. We stopped and took in the scenery and even managed to get in an ice cream and a glass bottle of Coke. It was the first time Tai had seen a glass bottle of Coke, so he tucked it into his pannier and kept it as a souvenir. Near the end of the day, we were closing in on Dosewallips State Park and hoped to camp there for the night. The road had been fairly flat, but it started to climb up and down the bays ~ nothing too serious, but we were closing in on 100kms and were starting to feel tired. 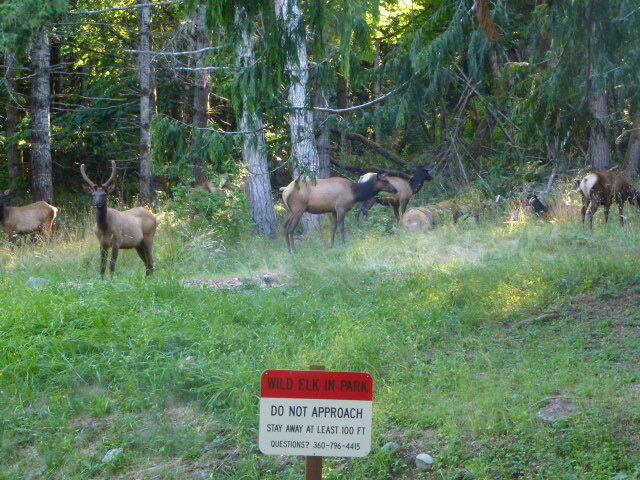 When we pulled into the entrance of the park, we were greeted by a herd of elk. They were quite a bit bigger than the deer we have on Denman, so we stopped and took a few pictures before finding a campsite. We found a nice campsite and set up our tent while having a Mike’s. We saw 2 recumbent tandems pull into the site beside us and I went over to check them out. It was a couple from New Zealand travelling with their 2 kids and they asked us where we were from. 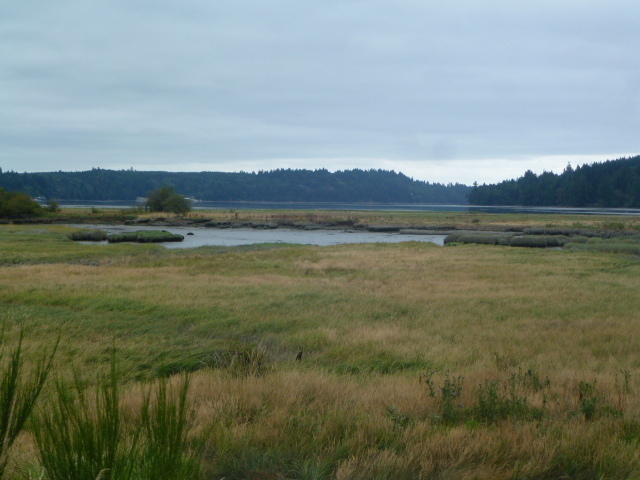 I gave them the usual answer of “about halfway up Vancouver Island”, thinking that nobody has heard of Denman Island. They asked where abouts, and I told them Denman. “I know your wife, Norie” the woman said. At this point, I hadn’t even told them my name, and they already know I’m married to Norie and my sons names are Tai and Ekou. Things were starting to get a little strange, but it clicked on me that Norie mentioned that there was a family from New Zealand that were travelling on tandems. They had stayed a couple of days at Fillongley Park about a week earlier and that’s where the connection was. 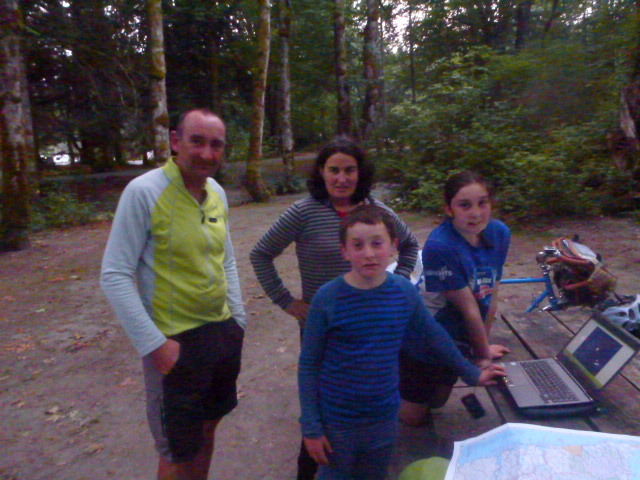 After dinner we spent the evening together going over maps and tell tales from the road. Sometimes you are just meant to meet certain people in your life. On the way in to camp we saw a herd of elk and we met a family from New Zealand. It was funny that they stayed at Fillongley Park and mom and dad work there. Mom was talking to them a week ago. we saw a car fire and big bumble bee. It was huge. We saw a blue jay flying on the side of the road. An armoured bank car passed us and it was bullet proof. We got an old new coke bottle and we drank it. It was awesome. We met a couple of Harley bikers and they had a sticker that said “We don’t call 911”. They were really nice. The guy at the bike store said there was a never ending climb, but it was short. 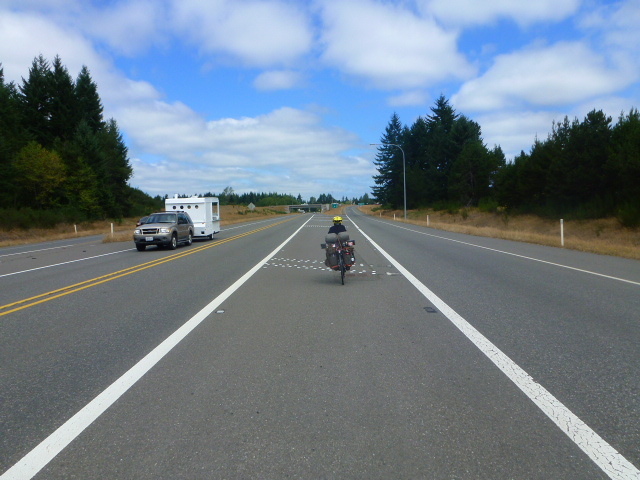 This entry was posted in 2013 Summer Bike Tour, 4 Legs and ! 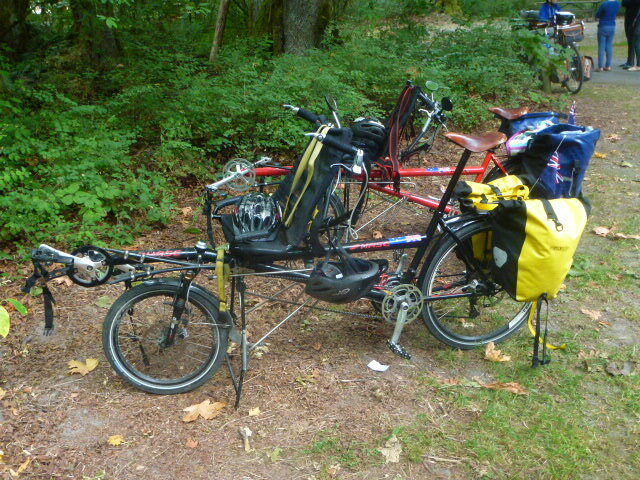 Mandolin, Bicycle Touring and tagged Bicycle, Bike, Box Dog Bikes, Cycle, Dosewallips State Park, hood canal, John, Kona Sutra, McGillivray, Old Town Bicycle, Olympia, Pelican, Tai, touring, Washington. Bookmark the permalink.